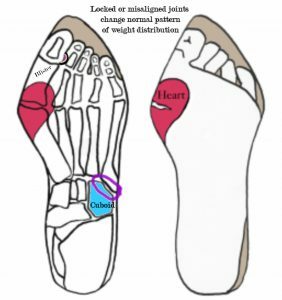 Locked or misaligned foot joints will change the normal pattern of weight distribution and this is the leading cause of bunion. Yesterday I worked with a client who made her reflexology appointment for stress management. She expressed feeling chronically exhausted but goes about her day as if it’s a normal way of being. “Oh”, she said, and by the way I have a blister on the inside of my big toe which comes and goes especially when I go hiking.” Upon looking at the blister I notice its placement against the intermediate joint of the second toe. I mentioned that blisters are caused from excessive friction and this blister formed from the big toe rubbing against the second toe. I also mentioned her great toe was misaligned. With an insignificant tone she brushed my comment away and said “Yes, I have a bunion” and further elaborated that these are the things that come with age and therefore this “growth” was an anomaly she was resigned to live with. Comes with age?! Not at all. I educated her on how the great toe misaligns when there is not enough room in a shoe to keep the toe in line with the first metatarsal and the supposed “growth” was a misnomer. As is so with many others she acted enlightened and hopeful in learning this information. Upon examining her shoes I noticed they were not far off base in terms of function but still the toe-box narrowed enough to taper the great toe laterally (bunion) and small toe medially (bunionnette). I alerted her that wearing this type of shoe style on a regular basis would deform the toes in this position and eventually cause other joints that knit the bones of the feet together to lock or subluxate. Recognizing her misaligned great toe had much to do with the stress she experienced throughout her body my intention for this session included reducing stress on her nervous system and reducing stress in the local aspects of her feet. After completing her reflexology session and integrating reflexing techniques on particular muscles that move and stabilize the great toe progress was noted by an increased range of motion in her first metatarsal-phalangeal joint. Gentle and specific jostling motions were then incorporated into the session to encourage a more open and relaxed relationship in the joints connecting the cuboid bone to the bases of the fourth and fifth metatarsals. This allowed these bone to rest in their normal position and took pressure off the first metatarsal and great toe. 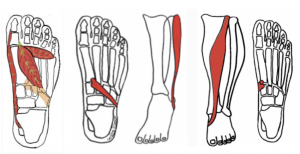 The cuboid bone is the keystone of the foot and captain of directing weight. Without the solid foundation endowed by the cuboid bone weight defaults and becomes misdirected. One sign the cuboid bone has become challenged is the formation of a callus on the plantar head of the second metatarsal. After this Structural Reflexology session my client’s bunion was a thing of the past and she walked away jubilantly and in amazement saying everything felt alive in her entire body and repeatedly mentioned she could not stop admiring her new straight great toe. You can learn how to do this too! Focus on these muscles in your next session. (A) Adductor Hallucis (transverse and oblique), and the Abductor Hallucis. (B) Fibularis Longus muscle to release tension at the lateral base of the first metatarsal. (C) Tibialis Anterior to release tension at its attachment on the medial base of the first metatarsal. It is important to note that bunions have varying degrees of dislocation. However, function and comfort of the great toe can be achieved even if the toe visually remains to appear deformed post session.